This could be a very exciting NFL draft for at least four historically black college and university (HBCU) prospects. It’s quite possible that linebacker Darius Leonard from South Carolina State, offensive lineman Brandon Parker from North Carolina A&T, defensive back Danny Johnson from Southern and running back Martez Carter from Grambling State could all hear their names called during the NFL draft this week at AT&T Stadium in Arlington, Texas. The NFL has some great players in the league now from the HBCU ranks, such as offensive tackle Terron Armstead (New Orleans Saints, Arkansas-Pine Bluff), nose tackle Javon Hargrave (Pittsburgh Steelers, S. C. State), Marquette King (Denver Broncos, Fort Valley State) and many others. In fact, brilliant running back Tarik Cohen was a fourth-round pick of the Chicago Bears out of North Carolina A&T last year. Cohen, a 5-foot-6, 181-pounder, had 87 carries for 370 yards and two touchdowns for the Bears in 2017, averaging 4.3 yards a carry. The diminutive rusher also had 53 catches for 353 yards and one touchdown, as well as a passing touchdown and a punt return TD. Cohen was one of the NFL’s top rookies. This year’s prospects have the potential to bring a lot of exposure to black college football. These four players clearly illustrate that there are some great players on both sides of the football. Fans should remember these names when the draft begins Thursday. 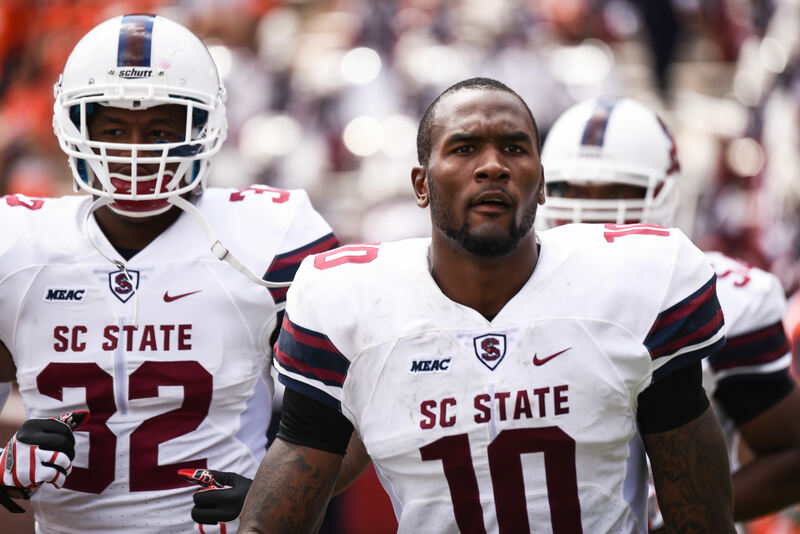 South Carolina State’s linebacker Darius Leonard (10) during 2nd half action between the Clemson Tigers and the South Carolina State Bulldogs at Memorial Stadium in Clemson, SC. Leonard, at 6-foot-2, 234 pounds, can go sideline to sideline making plays. He has a great nose for the football. He’s a good open-field tackler. He can rush the quarterback from his inside linebacker position. Leonard can cover running backs and tight ends in passing situations, and he has tremendous anticipation. Leonard was twice named the MEAC Defensive Player of the Year. He led the conference with 113 total and 73 solo tackles and two interceptions last season. He had an impressive eight sacks. Leonard played in the Senior Bowl and participated in the NFL combine. His athletic ability and overall knowledge of the game should help him at the next level. Leonard had a sensational career at South Carolina State, improving his game each year. He has the talent to become a real playmaking linebacker in the NFL. His speed and tackling skills will be an asset to any team. NFL Network draft analysts think Leonard could go in the second round. 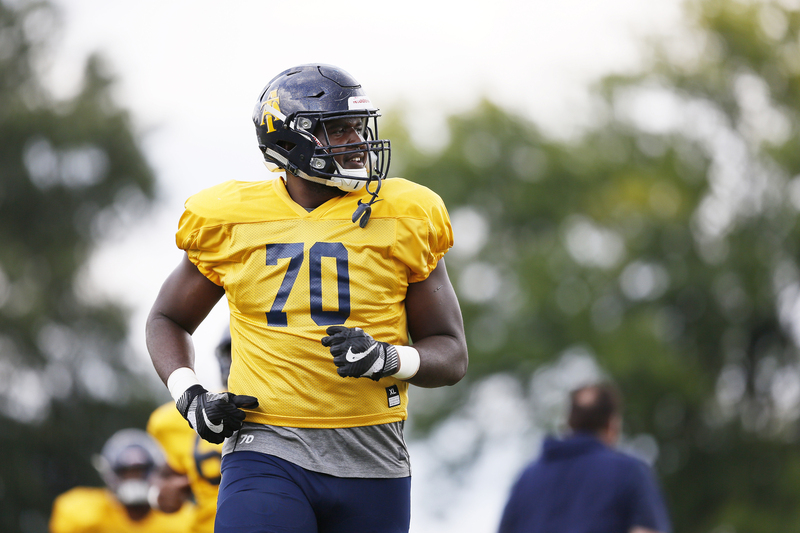 North Carolina A&T offensive lineman Brandon Parker (70) warms up during practice near Aggie Stadium in Greensboro, Thursday, August 24, 2017. At 6-foot-7 and 309 pounds, Parker has great size and length. He’s big enough to play tackle in the NFL, and he could play guard as well with his ability to move his feet. Parker opened a lot of holes for first-year NFL player Cohen, who rushed for 5,619 yards in his college career, partly because Parker is a terrific run-blocker. He was a big part of the Aggies’ high-powered offense. His pass-blocking skills provided magnificent protection for N.C. A&T quarterback Lamar Raynard, who threw for 2,707 yards and 26 touchdowns. The Aggies led the MEAC in scoring offense, averaging 36.4 points a game. He was a three-time MEAC Offensive Lineman of the Year. Parker completed his final season without surrendering a sack. Parker has all the tools to be successful in the NFL. He got a chance to play in the Senior Bowl and demonstrated a lot of versatility as an offensive lineman. His ability to excel as a run- and pass-blocker makes him an attractive player to a lot of teams. 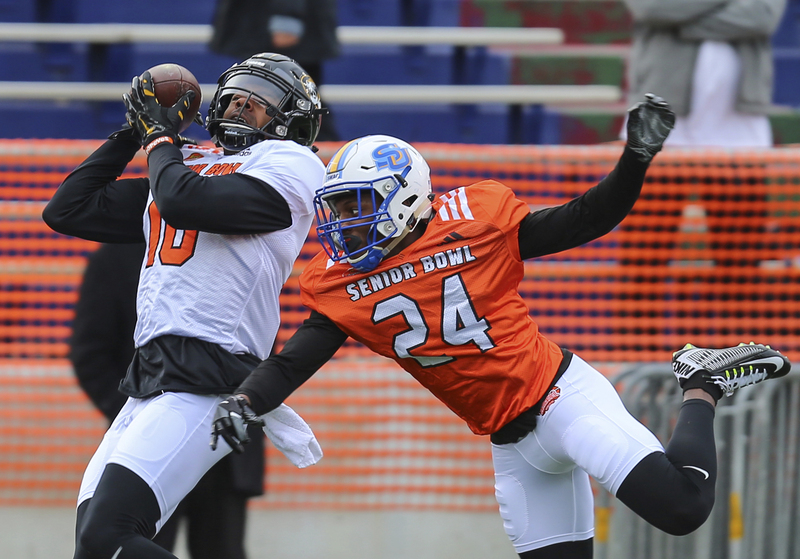 South Squad wide receiver J’Mon Moore, left, of Missouri, catches a pass over cornerback Danny Johnson, of Southern University, during the squad’s practice for Saturday’s Senior Bowl college football game, Wednesday, Jan. 24, 2018, in Mobile, Ala.
Johnson, at 5-foot-10 and 194 pounds, has excellent cover skills. He can run stride for stride with the receivers and has good speed. Johnson had a great season in pass coverage, with three interceptions, two of which were returned for touchdowns. Johnson can not only pick off the passes but also take them all the way to the end zone. He rounded out his coverage with 15 passes defensed. Johnson does a nice job of playing the run. He had 55 total and 43 solo tackles. He was one of the SWAC’s great all-around defensive players with his quickness and playmaking skills. Johnson has the ability to change the game with all the things he brings to the table. Moreover, he had a chance to play special teams at Southern. Johnson had a fantastic year as a punt returner, averaging 17.1 yards a return. He had a 68-yard punt return for a touchdown last season. His special-teams skills could help him get on the field very quickly in the NFL. 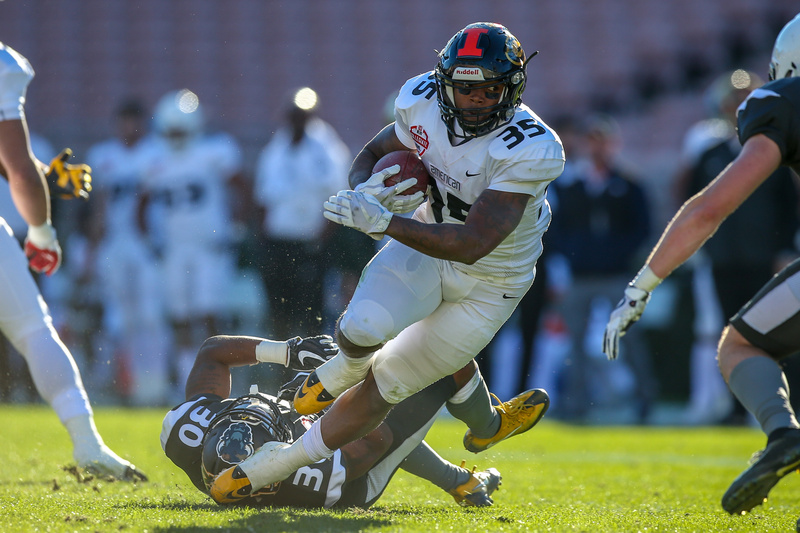 American running back Martez Carter (35) from Grambling State runs for a gain during the NFLPA Collegiate Bowl on Saturday, January 20, 2018, at the Rose Bowl in Pasadena, CA. Carter, who is 5-foot-9 and 205 pounds, can really run between the tackles. He has a knack of squeezing through the cracks of the defense and has good speed to get to the edge. Carter gets to the holes very quickly, which most NFL teams like to see. He’s also a very crafty runner. Carter knows how to cut back against the grain. Carter had a great season for Grambling State. He had 167 carries for 854 yards and 10 rushing touchdowns, averaging 5.1 yards a carry. Carter has a good pair of hands too, with 33 receptions for 401 yards and two touchdowns. Carter made a lot of big plays for the Tigers. He’s not a big running back, but the NFL has its share of little running backs who have made an impact offensively. Carter has demonstrated the ability to run the football as well as catch it coming out of the backfield. That shows his value as an offensive player. Donald Hunt, a writer for the Philadelphia Tribune, is a longtime ESPN contributor who has covered Historically Black Colleges and Universities.